I’m back from fabulous Cincinnati, and my brain is pretty close to fried. 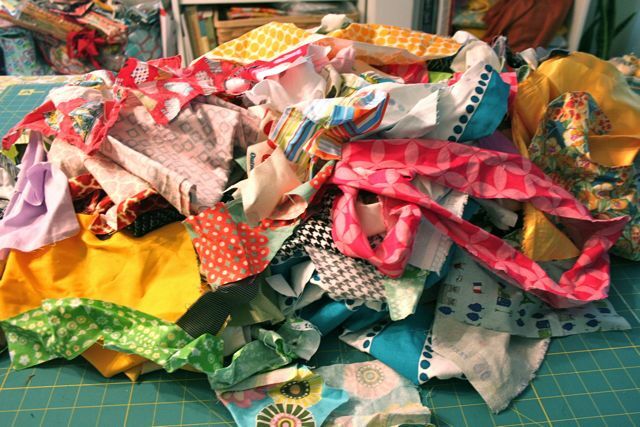 Am taking a day of R & R, sorting my scraps. You might recall I did this once before, and it had a spectacular and largely unexpected therapeutic effect. Looking forward to turning the brain off for a day. Anyone have any other suggestions for post-deadline decompression? Besides retail therapy? ← Patch Pockets Come in Shapes! Do tell us if you are sorting by project, like you did last time, or if you are sorting under a different rubric now. Oh, and happy decompressing! Totally sorting by the same rubric. To the point that I had to review my OWN BLOG POST to remind myself of what the measurements were for each pile. Because it has been that long since I’ve gone through my scraps–did I tell you I moved a GIANT box with me into this house? I can’t move it again, I just can’t. Off to do more cutting and trimming!! A brisk walk or exercise of some kind always helps me! Ugh, I should be doing that no matter what, every day! My husband got me a treadmill (at my express request) at an estate sale last week–can’t wait to be able to combine your advice and Zoe’s and watch girly movies while pumping up my endorphins!! How’s THAT for a rockin’ Friday night? Whaaaaaat? You heard me. Sandra Bullock is my guilty pleasure. Or Julia Roberts. I could watch anything either one of them has ever made (except Eat, Pray, Love which I couldn’t face). I suggest Mellow Mushroom veggie pizza, gossip, and house fantasizing with one of your best-ies. Namely, me. Sadly, I’m leaving you for the weekend to be with my in-laws (un-woot). But next week, Lady, it’s a date! Um, yes, yes and yes. Done and done.